Potato soup is one of my favorite recipes. With some cheese it is wonderful, and if you fry up some bacon to sprinkle on it…over the top! I even pureed some for baby J’s lunch. To make the recipe more baby friendly I removed the salt and garlic salt and added 4 cloves of fresh crushed garlic instead. For the adult salt lovers eating this meal, we just added the salted to our bowls. cover with water and cook until soft but not too mushy. 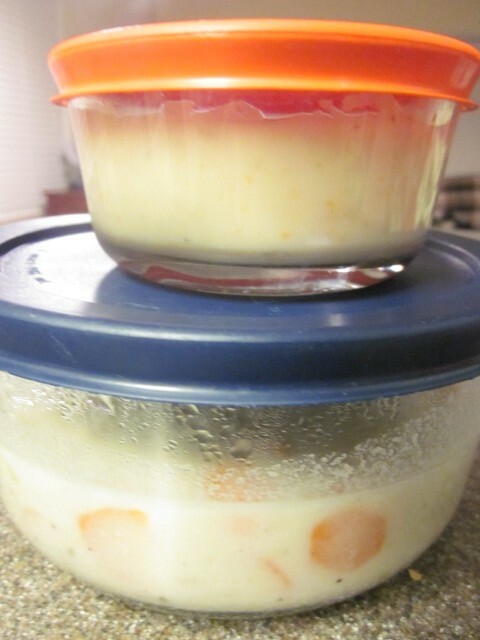 If you want the soup to be thicker…more chowder like…pour off some of the water. Love potato soup – can’t wait to try this out. If you give it a try let me know what you think. I plan on adding some Cheddar Cheese Soup to mine next time!